KNOX UNITED named after Mrs. Martin's Father. This history of Minitonas Knox United Church was given to us by Isabelle McKay, and comes from a write up originally done by her father, Thomas Martin, and also from a write up of Ashley Ireland. 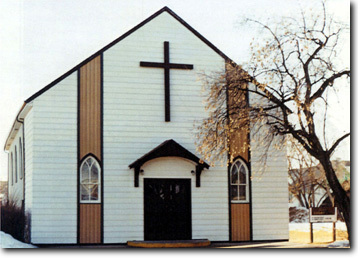 The church first began as a Presbyterian Church in 1899 with Rev. F. Johnston as Minister. His headquarters were in Tent Town and he was Minister at large for the whole Valley, along with Rev. North. Services were first held in homes, halls, in the C.N .R. station, the hotel and store. In 1900 a Union Sunday School was started (and plans were implemented to build) and that summer both the Methodist and Presbyterian Congregations built churches in Minitonas. The first world war caused a shortage of ministers, so the 2 churches developed a Co-operative phase. There would be a minister of one denomination in one charge, and one of another denomination in the next. This may have smoothed the pathway for the amalgamation to form the United Church in 1925. In 1900 the Methodist Church in Lidstone had 55 members while Minitonas had 58. Church services were also still being held in the rural schools, even tho' the church buildings were in Minitonas. - The first harvest-home supper and concert was held in the hall in 1900, admission 25 cents. - First ordained Minister was Rev. Geo Aithen who came in 1904. The present church was built in 1952, with many, many hours of volunteer labor in building, canvassing and providing meals for workers. The church was officially opened and dedicated on the first Sunday in 1953.